Super Dodge Ball for the NES is often heralded as the single greatest video game of all time. It was one of the few titles that never had 'Joe-Gamer-Off-The-Street' notoriety yet carried a great cult following in the dark days before The Internet. I remember personally looking from 1990 to 1998 for a copy from various used games outlets, it was right around this time that it became a better recognized game and copies started to fall from the sky. Where as I had to pay a small fortune for my cart 4 years ago, Super Dodge Ball can now be had at almost any Funcoland for 12 dollars and still remains a remarkably good game, especially when played with 2 people. The Super Dodge Ball (NeoSDB) that is the focus of this review is the spiritual, if not the literal, successor to that line. The question is how does it stand up against the original? Is it worth the $500+ you're likely to pay for a mint copy? SDB is to NeoSDB the same way Ice Hockey for the NES is to Mutant League Hockey for the Genesis. What does this mean? I'm not sure. It sounded profound. Wait, I remember... SDB plays a little more like a traditional sports game with a little spice thrown in, where as NeoSDB plays a little more like an extrapolation of a sport, understand? No? Okay. SDB is played with a larger team as well as players of varying skill level. Most casual SDB players won't notice but the die-hard fans will let you know that each individual player not only has a name but stats specific to that character. So losing 1 guy is not the same as losing any other guy. NeoSDB on the other hand has a smaller team and where these characters are visually different in looks as well as super-throws they are indeed all the same. No one character is stronger or faster than any other, and as all super-throws are performed the same, there is little to throw you off if your favorite character gets out early. The super throws are performed either by a simple "fireball" motion or a "dragon punch" motion. 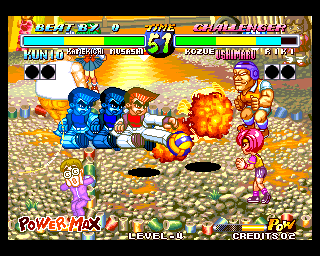 There's a super-counter that reflects the ball back at the team who threw it (done by the "dragon punch" motion) as well as Team Super Throws, performed when your 'POW' meter is full. The learning curve on NeoSDB is very shallow and is one of the few games I've played on the Neo where the "How To Play" Screen really tells it all, or enough for you to play well as you pick it up. You see, in NeoSDB when a character is 'out' they go to the side lines and continue to play, they can even do their super-throws as well as the super-team-throws. In SDB if a character is 'out' they're gone. Therefore a degree of character management and strategy is present in the original that is absent from the Neo•Geo incarnation. That's not necessarily a bad thing or even an unforgivable thing as NeoSDB was designed to be a quarter eating arcade game and not a sport-simulation. That being said, I would have liked to have seen a little more depth with regard to the character's stats. The single player mode is a very cool game that is not with out it's flaws, namely cheap computer A.I. You'll find yourself more times than not throwing the ball mindlessly back and forth between you and the computer, basically waiting for someone to make a mistake (guess who that'll be) and cursing every time your opponent catches or returns your super throws. 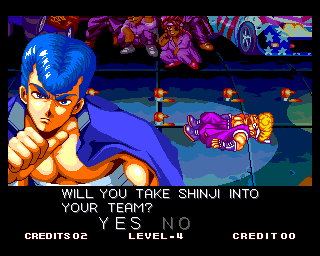 There is a saving grace among the stat-less characters and the cheap A.I., a great move by Technos was the option to pick up the star player of the team you just defeated. This is a very welcome addition as you are never totally married to one team. You start off with a star player and two scrubs who play just fine, except they don't have a Super Team Throw. In theory, you never have to change your team as I mentioned one character is as good as another. Aside from that it's a really cool option and adds a little bit of that depth and strategy I mentioned was missing. SDB Strategy and Character Depth. Legendary 2 player mode. Stupid A.I. Lacks flair. NeoSDB Interchangeable Characters, Shallow Learning Curve, Very Good 2 player mode Annoying A.I. No Character Specific Stats. Now the categories tilt way in favor of NeoSDB, so we'll keep this as a qualitative analysis based upon the capabilities of the hardware it's running on and not a head to head comparison. SDB was vintage 8-bit graphics. Pure manna for connoisseurs. The game suffers from a major case of the flickers though. Defiantly not the best piece of eye-candy to cross the Entertainment System of Nintendo but charming. 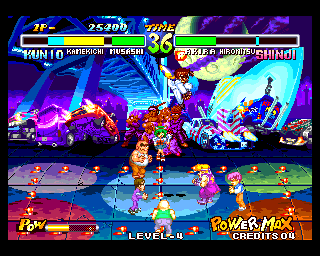 NeoSDB on the other had is a very good example of Neo•Geo graphics abilities. The famous Zoom is included in the game, although it's not as well utilized as I have seen it. The game itself has a tendency to zoom REAAAALLLY far out. While a nice effect, it is a little difficult to see on my 25" monitor...I could only imagine what it'd be like on a 19". The sprites are very well done and have great detail, although a couple characters look like they have a 2 color palette. The game plays smooth throughout, animations have a fair amount of frames and the quality of the pre-game cinemas are second-to-none. 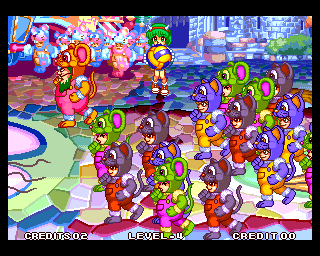 An amazing amount of animated cos-play mice sprites running across the screen in vibrant color is definitely a show-stopper. SDB Technos-Style Big Heads, very cool. Frame rate and Flicker Gremlins are on the loose. NeoSDB Miyuki's Intro, Colorful and detailed backgrounds, smooth animation. Certain characters, I won't name names but you know who you are, have the color palette of a bad NGPC game. Graphics Winner: NeoSDB. Okay that wasn't even close. As much as I like the style of 8-bit games and as I can't honestly show you a much better example of an NES game, I really can't give you a worse looking game either. The game wasn't pushing many limits and was an earlier title. NeoSDB, however looks good all around and could probably pass for a Saturn game. You'd never confuse SDB for a SNES game would you? Again, looking at things relatively I'd say that the SDB took the NES just as far as NeoSDB took the Neo•Geo hardware. SDB has clean sounding and catchy music, maybe on the annoying side. NeoSDB has good music and voice samples as well as some good sound effects. SDB has about as much sound effects as any NES game. SDB Catchy and Annoying. Clear. Catchy and Annoying. NeoSDB Very clean voice samples, good music, rich sound effects. It's definitely no Last Blade 2. Sound Winner: SDB. It was super tight. SDB really doesn't have spectacular audio, but it is defiantly well within the field of the NES games and could be called better than most. NeoSDB on the other hand sounds perfectly fine but really doesn't feel like it's pushing it's hardware. Another one that could go either way and since I gave Gameplay to NeoSDB I have to give Sound to SDB. What makes a video game good, a good game great and a great game a legend? It's those little things you can't quite describe. It's actually kind of humorous that I'm attempting to make the category which describes things you can't quite measure into a direct comparison! Nostalgia is defiantly in favor of SDB. Is this a fair criteria to grade on? Absolutely because it does effect the feeling you get when you play the game, does NeoSDB have any chance of winning out over SDB? None what so ever. Is this fair? It has to be. Shouldn't we gauge this like the graphics based on the merits of the system running it? Is NeoSDB nostalgic compared to KOF2K2? No. Because nostalgia comes from the player, personally. Therefore SDB has an untouchable lead in the the 'intangibles' so far. Style has to go to NeoSDB. The characters are drawn in a very, very "Japanese" way. It feels the way it should. You can defiantly tell it has some "Neo•Geo Fighter" blood in it, which is not only welcome but almost expected. SDB, while notorious, is very bland looking and doesn't carry the same patina that NeoSDB does. Replay again has to go to SDB. I can't stress enough that it has more depth, again acknowledging that NeoSDB is an arcade game and depth really isn't it's best suit, it's something that is important to the players and SDB has it where NeoSDB doesn't. Pick-Up-And-Play Factor goes to NeoSDB. The game was designed specifically for this so it's not surprise that it should take this category. The matches are fast-paced and fun and a great way to spend 5 minutes while waiting for a phone call, the pizza guy or the Steeler game to start. SDB matches take much longer, and with the aforementioned and here-to beaten to death "depth" a little more patient and strategy is required. The "Cooool! What is that?" Factor goes to NeoSDB. If you were to play either of these games at a party, the one to draw the most attention would be NeoSDB. Lots of nice graphics, sound and it just looks fun. SDB just looks confusing. The majority of the humans would gravitate towards NeoSDB, where as only experienced game players would know SDB when they see it. A factor that would be important if you ever decide to put a cab on a route. Also NeoSDB is the only game where the opponent gives you the finger. That's always cool. SDB It is the Super Dodgeball. Has oodles of replay. It's style is best defined as "Hey it looks like River City Ransom". Japanese at heart, but not really. Intangible Winner: SDB. The category is titled towards SDB. NeoSDB has some definite good qualities but it's a hard change of heart to go against the original. Overall Winner: Super Dodge Ball (NES). I make no apologies. At the end of the day, SDB is the better game. Is NeoSDB worth a purchase? : Yes. Is NeoSDB worth $500? : If you have the means, HELL YES. I wouldn't save your pennies for 2 years to pick up a copy, but if your budget can fit it...no cab or super gun should be with out one. It's an original, challenging and fantastically fun game that no one should miss.